This official Samsung 1.3 metre charging cable comes complete with 3 Micro USB tips and a USB-C adapter for compatibility with the vast majority of smartphones. The cable is a good length and the connectors have a good solid fit to both devices. I did notice though that when 2 devices are plugged in to charge, my phone said it was a slow charge, however I am not too bothered about that. I may purchase another for use in our motor home to save on plug sockets. Very pleased ! Search is over. I have been looking for a Samsung charger that will charge my Samsung Galaxy TabS and this is it! Very useful to be able to charge more than one device at a time. Delighted with this product! Just needed to know exactly what the product description told me, which it did, admirably. Already had one of these but thought I had lost it and ordered another because I found it so useful. However found the first one and now have 2. Glad to have a spare. Excellent, exactly what i needed and does the job. I knew what I was buying and i am not disappointed! 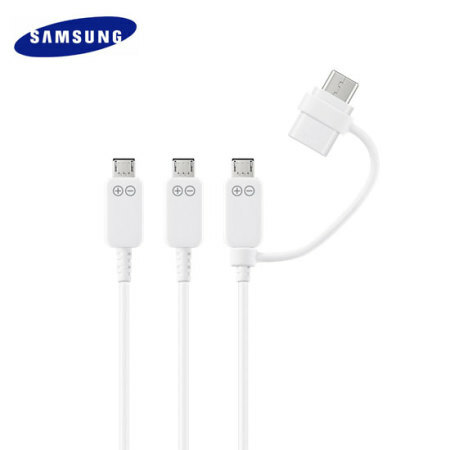 Genuine Samsung product, charges quickly, extremely fast delivery and great customer service! Am I happy "YES DEFINITELY "! I've been looking for authentic Samsung chargecord for my tablet and this was the only place I could find one. It charges fast. It can charge 3 Samsung devices at the same time, but the directions do not recommend it due to slow charging. That's the reason for 4 out of 5. Shipping was fast and reliable.